- Instructor Guide sold separately. One card is for the child's reference and displays a large (5"x7") colorful illustration of the yoga pose on the face. Benefits and verbal cues for correctly forming the pose are on the reverse. The companion instructor cards contains the same information as the child's picture card as well as reading readiness and language development questions for quick reference. - Ages: 2 and up. Easy to read positioning cues and language questions. This set of cards is an innovative combination of yoga postures and language development activities written specifically for preschool to early elementary aged children. ABC Yoga Cards for Kids target developmentally appropriate learning goals. 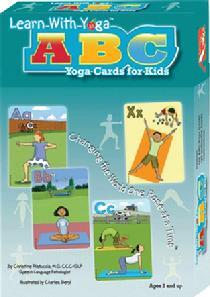 ABC Yoga Cards for Kids are beneficial to educators, specialists, yoga instructors, families, and children. Research shows that learning is significantly enhanced when movement is a part of the activity. Movement engages the senses and stimulates brain activity. The more the senses are engaged, the more learning occurs, and the information learned is better retained. Since yoga engages the body in the broadest range of movements, it is one of the most ideal disciplines to affect productive learning. As an individualistic and non-competitive exercise, yoga, unlike many other games and sports for children, allows all individuals the opportunity to participate. Promotes effective techniques (such as breathing) for managing stress.